This is quite possibly the girliest thing I have ever made, but what can I say? I love me some Swarovski crystals. This wasn't too hard to do, and other than the crystals, cost very little to make. If you substitute cheaper beads for the crystals, you should be able to make your own for $15 or less. Of course, you don't need a mobile at all: you can also hang this from the ceiling with ribbon. The wind-up mobile base just allows it to rotate and play music. LOOK AT THAT WOMAN'S DRESS. 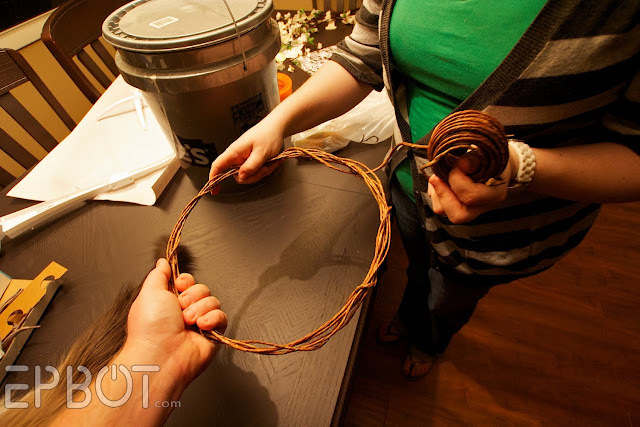 I started by wrapping the wire around a five-gallon bucket (which was the perfect size for the mobile) four or five times, then had John help me hold it all together while I spiraled the wire around the ring once to secure it. It's hard to see, but I made my strip of wire into a "U," brought that up from under the white mobile arm, and then wrapped each edge around the wreath. It's completely secure; the wreath won't budge no matter how hard I try to wiggle it. Ok, the base is done - now to the butterflies! If you have a butterfly punch (or better yet, several in different styles), use those. My way will take a little more work, but it's also only $2 to get 5 different styles of butterflies. Not too shabby. 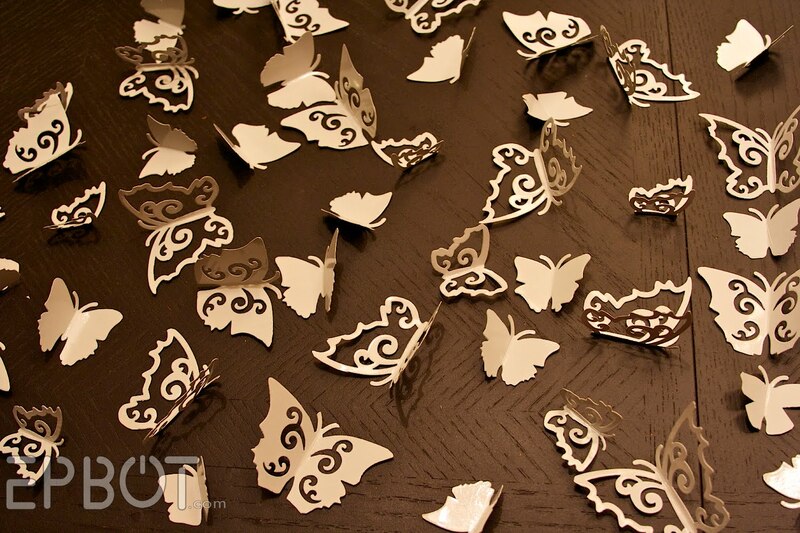 Cutting out each butterfly was harder than I expected since the design overlaps, forcing you to choose which butterflies you want to save and which to cut through to salvage the others. Tricksy. Just take your time & use a pencil to sketch out the harder areas. Then use a ruler & the blunt edge of some scissors to make a crease and fold all the wings up. Attach the mobile to a chair so you can gauge the height of your strings as you go. You don't want them too long, so aim for the length of the original hanging toys. 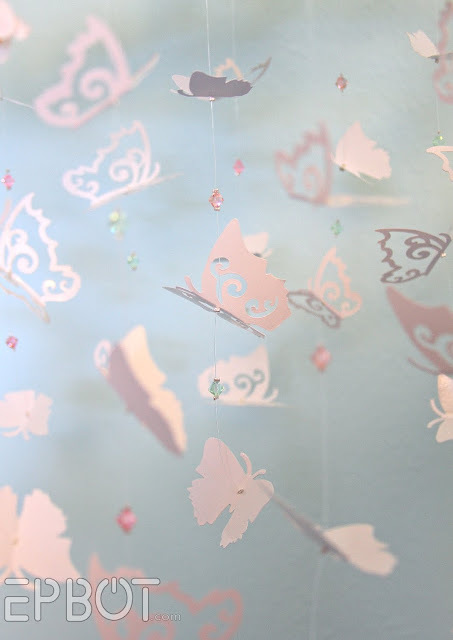 Balance each of your butterflies upside down on a needle to find the sweet spot where it hangs level, and then pierce the paper with the same needle. Keep the holes tiny. 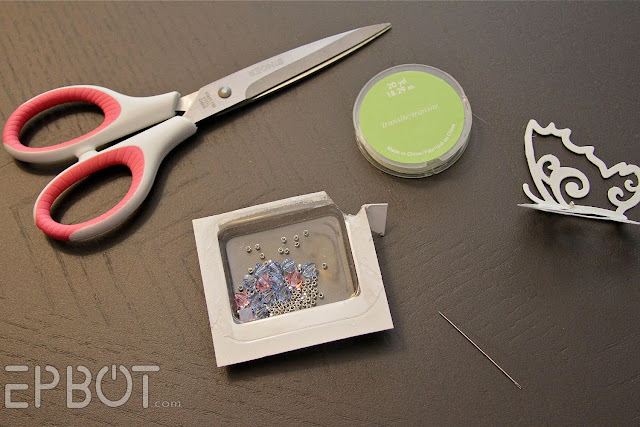 Start each strand with a crimp bead (use small pliers to crimp them in place) then start layering from the bottom up with your butterflies and crystals or beads. 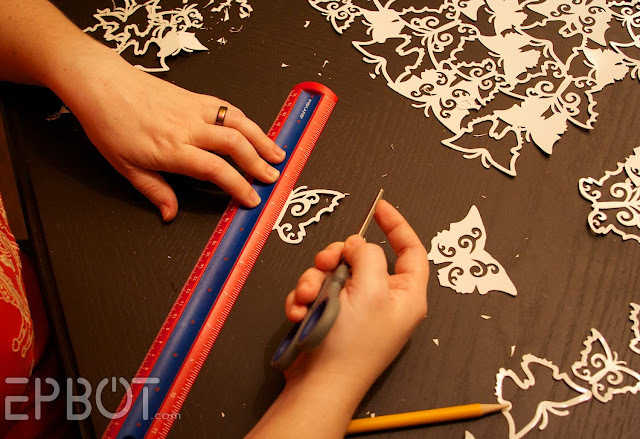 Sandwich the butterflies tightly between two crimp beads to ensure they hang level. Make as many strands as you like, keeping the arrangement somewhat random. I made sixteen, most of which had three butterflies and two crystals on them. The rest had two butterflies and one crystal. You can hang each strand as you go or wait until you've made them all. Your choice. 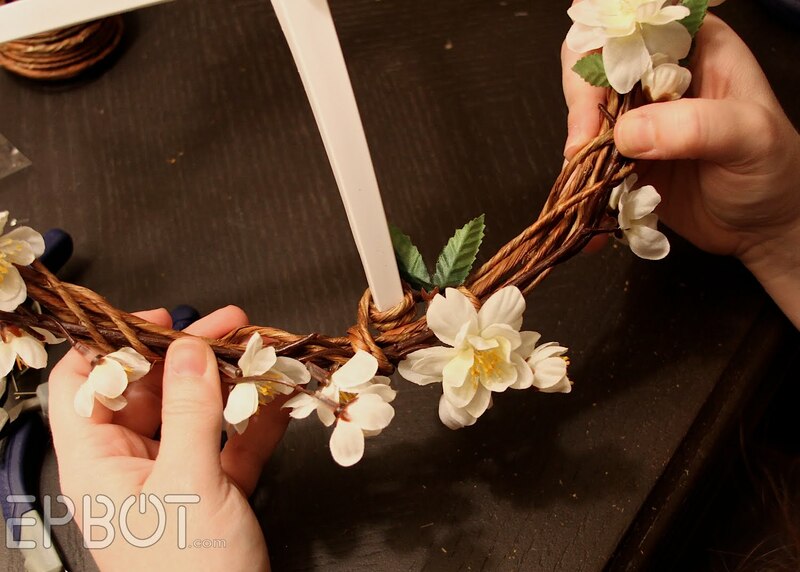 Knot each strand securely around a single "branch" of the wreath and top the knot with a dab of superglue, just to be safe. 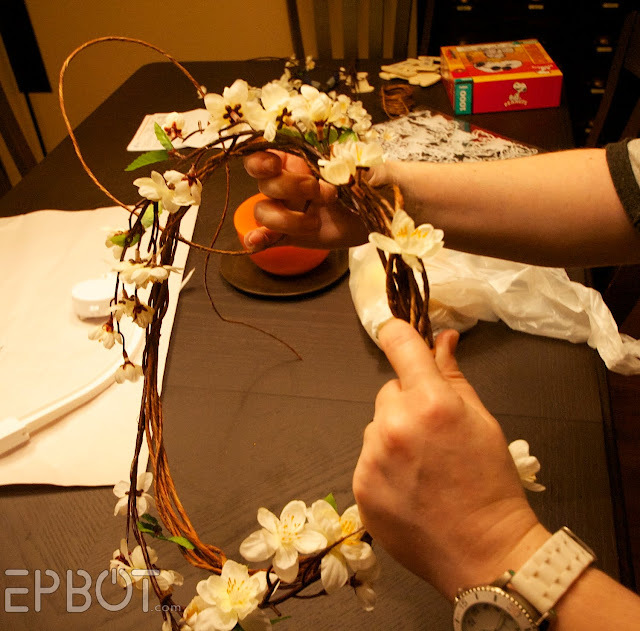 Then trim the strand edges, and stand back to admire your work! I like everything you've made, but this is by FAR my favorite and I'm not very girlie girl either! It's just so delicate and natural and very cool! I will more then likely use the butterflies in my bedroom. I am 28 years old and married but my husband and I sleep in different rooms due to we sleep different schedules. 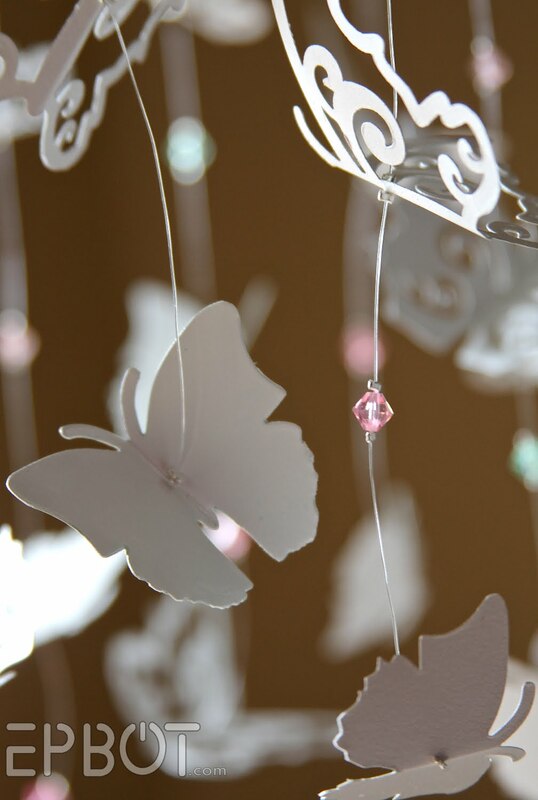 I am decorating my room in black, purple, and silver and i was trying to figure out how to incorporate butterflys into it. I am curious, though, how old the baby is, because if she's old enough to crawl, this wouldn't be safe to put over the crib, at least not within her reach. But it is incredibly beautiful. I supose the plan is to hang it from the ceiling? Not to worry, Kristy; the baby isn't even born yet. And yes, once she's old enough to push herself up the mobile will have to go elsewhere - although from what I've read that's true of all mobiles, since you don't want the kids to grab them! So gorgeous! I love home-made - it's so special because so much love goes into it. 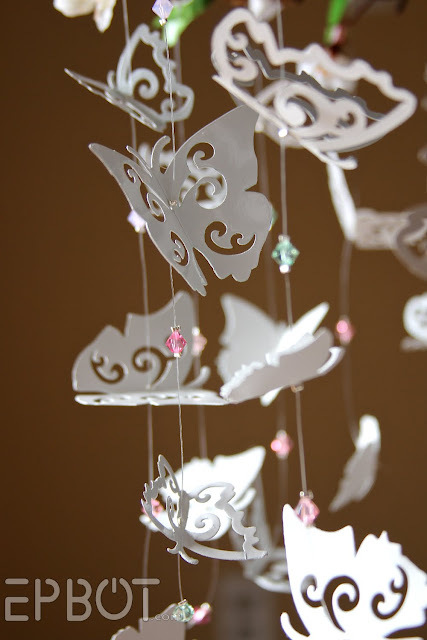 And I was surprised that the butterflies didn't tangle as the mobile spun! Did you test it beforehand? Amazing! That is beautiful! Feminine w/out being nauseating, and so delicate & airy looking. I love the motion in the video - that sold me! My ever hopeful self will have to make one for our someday-baby :) Thank you for sharing, I love seeing what you create! looks great! we appreciate it and yes you can do projects at our house whenever you want! Gorgeousness! What an awesome idea! I am way impressed--way to go Jen! That is gorgeous. And so much more special than Winnie the Pooh. I mean, I love Winnie and friends, but it's not nearly as creative as this. 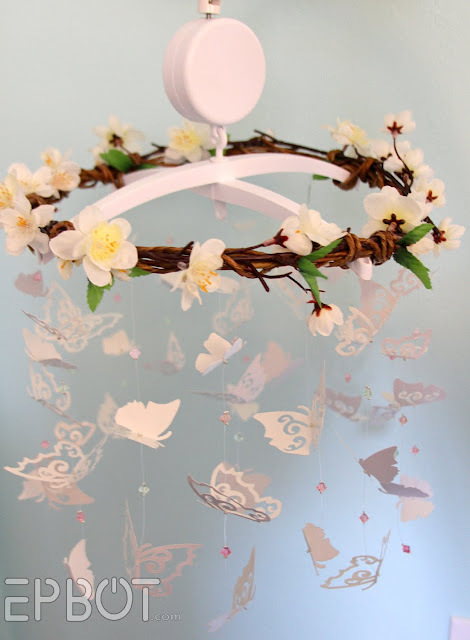 This is gorgeous and I can't wait to make one for myself. It's cool how the paper doesn't weigh enough to pull all the curl out of the filament, so there are swooping butterflies at the bottom. Hooray for happy accidents! I also enjoyed the sneaky cameo by Kitty in the photo where you demonstrate how you made the wreath. Love this blog! You really inspire me. That is sooo lovely. Light and airy and when it turns around all the flutterby's are flying. Just lovely. Off topic but your cherry blossom wall mural inspired me that maybe, just maybe I could do a piece of wall art similar to a piece on the cover of this weeks Target ad. It is still brewing in my head but your tutorial on how you did the mural makes me think I might be able to pull it off. Thanks for the inspiration. I have never commented on here before but I felt it was time. Love all the crafty projects you do. But this might be my favorite. It is just so cute and pretty and girly without being overly girly. That is stunning. I love it. Too bad you don't live near me. I totally would have let you decorate my nursery. Though my husband and I did a pretty good job, we just used wall statics instead of murals. Awesome! I'm kind of mobile-obsessed right now because I finished up the one for my three-week-old's room the night before the c-section. (Yep. 5:30 a.m. appointment at the hospital, and we were up at midnight after the Oscars, hanging hot air balloons, dirigibles and clouds from eye-screws in the ceiling. We know how to use our time.) Yours is wicked cool! What a wonderful, beautiful thing to do for your friend! How luck for them! If only I could figure out a way to hang my sons' LEGO creations, we wouldn't need half as much shelf space. Ha! Wow, this is amazing! 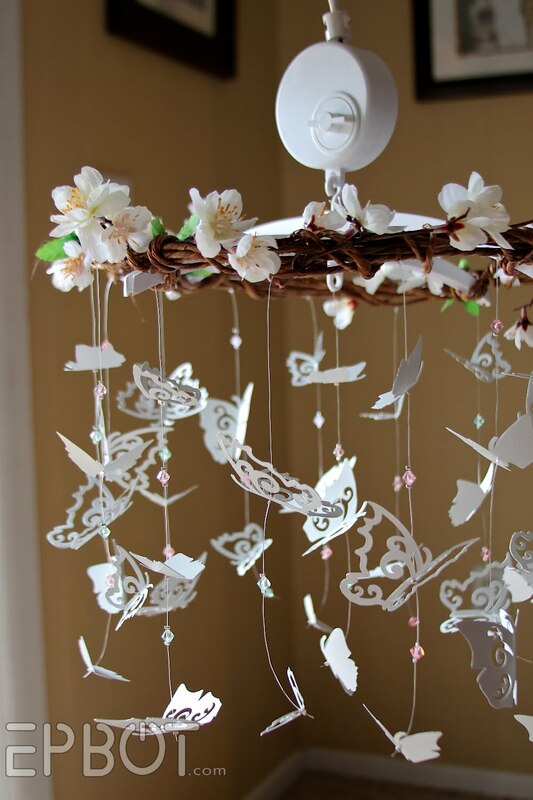 I don't usually like girly things, but this is so lovely, and you give such great instructions, I can't wait to make one, probably for my mom. I can also imagine stamping the butterflies (pre- or post-cutting) with a rainbow of colors, though I love them in the pristine white too. You are so gorram talented! I'm having a little girl and we are making a geeky nursery for her. We are making 2 mobiles- mostly as a challenge to each other. My husband in making one with plastic superhero toys, I'm doing a paper one with card stock black and white cut outs of starships (Star Wars, Star Trek, Serenity, at least 1 Tardis). 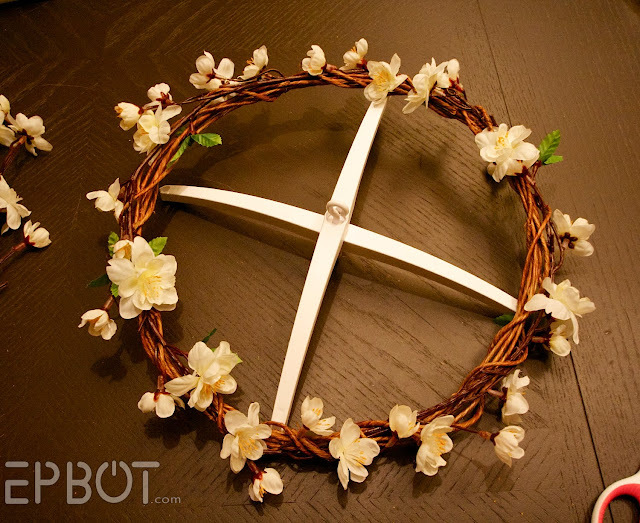 I was thinking of something like yours but with star charms and using an embroidery hoop as the base. ANyway, I'm not using a real mobile as a base, so I wondered about how long did you make the filament/cord? As usual I love seeing all the things you and your hubby create, but this takes my breath away. Simply fabulous! Each strand hangs about ten inches from the wreath, Microbial Tea (Can I call you Micro? :D) but you can wing it with the lengths. 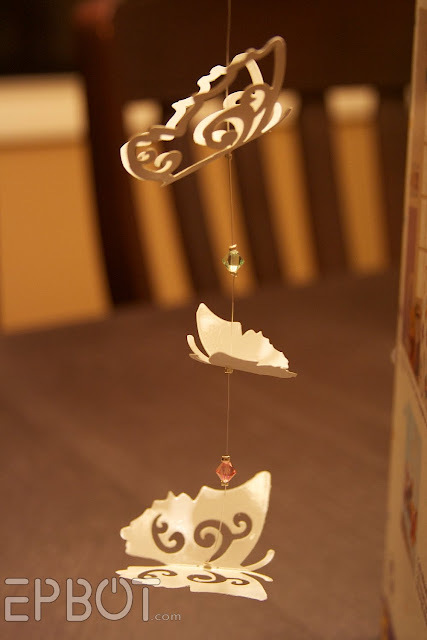 I've seen some really cool mobiles that used a small top hoop and super long strands, giving it almost a wind sock look. OK, that's cool. And funny..... That is the same mobile I had for my oldest son, he's 15 now!!! The butterflies are beautiful though! Maybe I should dig out his mobile and do something with it. 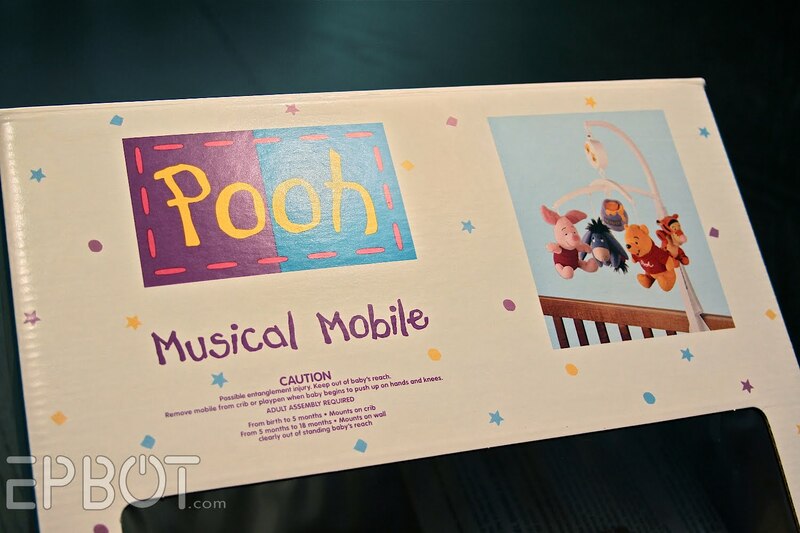 That is a lovely, creative mobile. However, there seems to be a problem with the video for us, we cannot see it at all. Did John(thJ) block out part of Canada again? I hope we can find that brown wrapped floral wire here, because it has given us some crafty ideas. The mobile is gorgeous! But honestly, what really caught my eye was the Pooh mobile you used as a base. 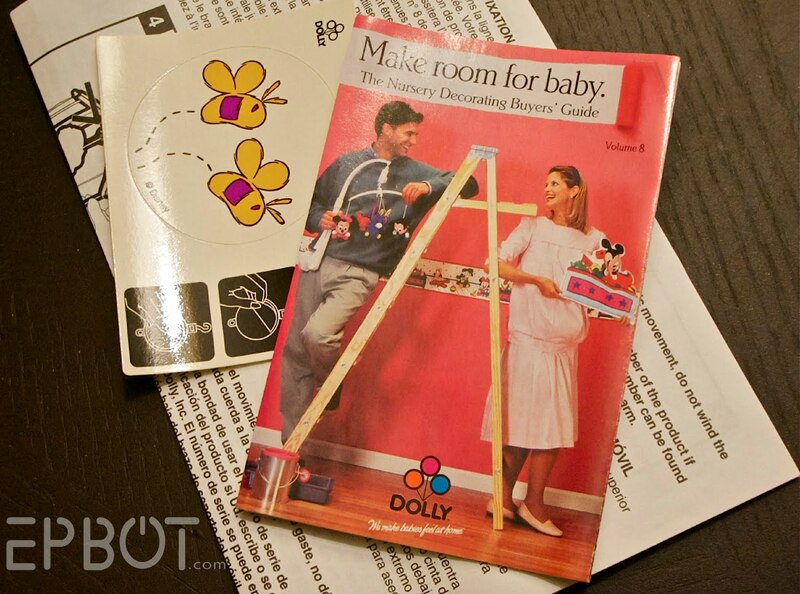 I used to work for the Dolly company who made those. I was primarily in the Lamp department, but was sometimes shipped off to other departments. Mobiles being one of them! I packed tons of those things and most of us had bags of the leftover stuffed characters used. I loved working there so much. Thanks for bringing back so many great memories! That is beautiful! My husband and I are planning to start trying for babies later this year and this is making me want a little girl even more! Love this! 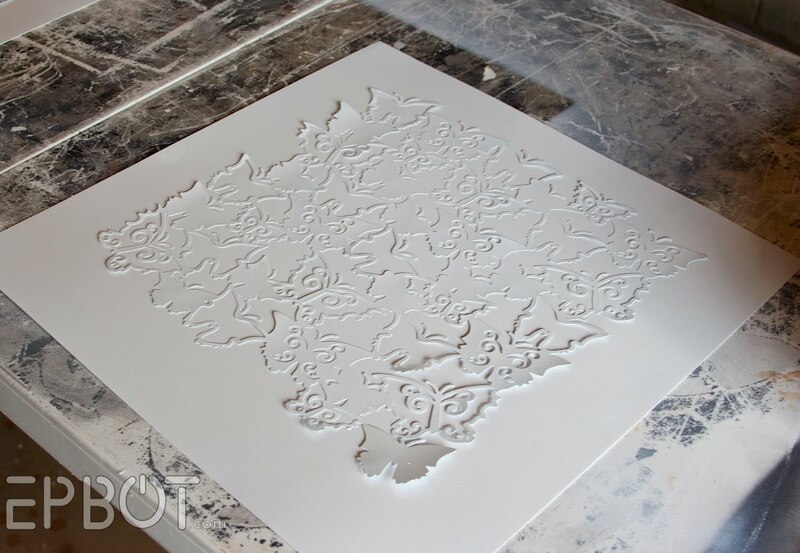 I want to do it in silver to match my room (why yes, I am 40 with gray hair and no kids - why do you ask?). I LOVE (read again: LOVE) the way you blog! It's EXACTLY how I would do things. Including the girly mobile with butterflies. I was about halfway down the page with a goofy smile when I hit BOOKMARKS to save this on my *holy* Bookmarks Tab. I will be visiting again. 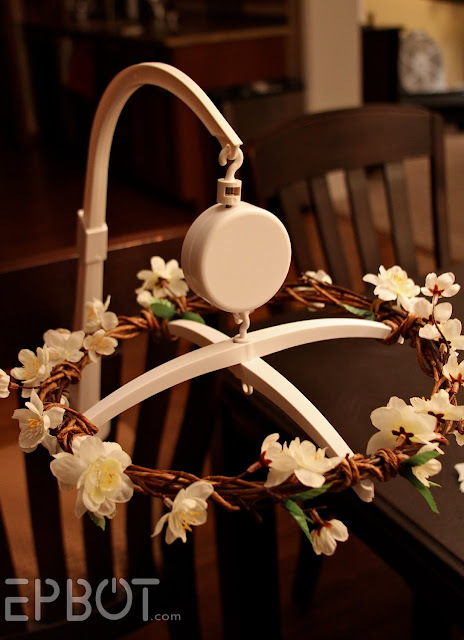 From one geeky crafty girl to another: Job Well Done. Awesome Blog, Awesome Ideas. This is creativity at its best. 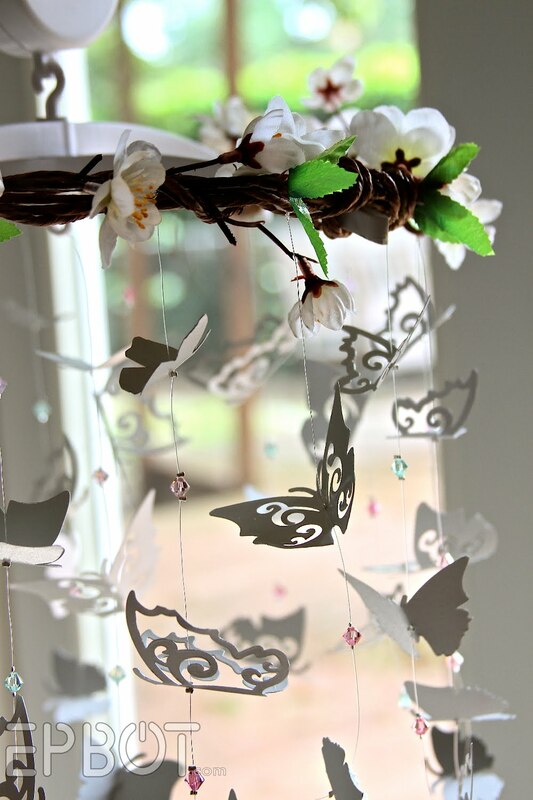 Such a lovely project and it looks enchanting! Such a wonderful project and it looks enchanting. Thank you for today's dose of inspiration! :) What a great blog! !